Many years ago, when but a youth, there was my first Pineapple Quilt. So now, a “bit” older, why is there a second Pineapple: with “A” done then why “B”? The Maryland Historical Society is a love interest. As it thought of its 150th anniversary of service in Baltimore it began to plan for an art show of quilts both old and new. 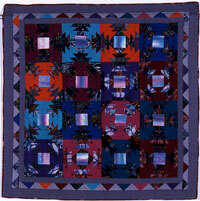 The curator asked if I would do a quilt which embraced both the traditional and the contemporary. And thus came - “B” Pineapple: Now and Then. 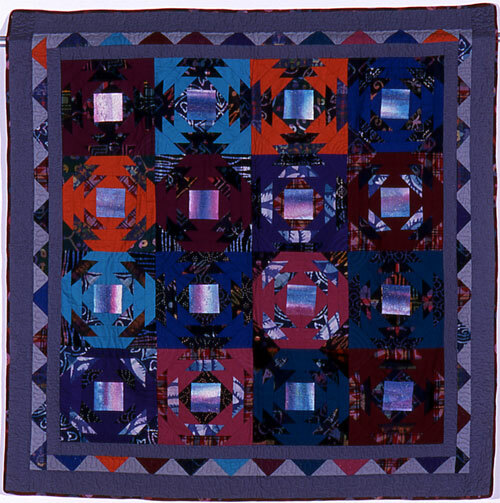 Prairie points crossed with metallic thread, jewel-toned cotton fabric, over-dyed patches, spray painted squares centered in blocks of traditional design, madras demonstrating a log cabin variation, hand and machine stitching, colored cloth suggesting Amish strength: the old and the new. Pineapple “A” growing up to be a “B”.